For an extra-relaxing week between Christmas and New Year’s, have these meals on hand in the fridge or freezer to reheat as you need them. 1. Chicken Tinga. 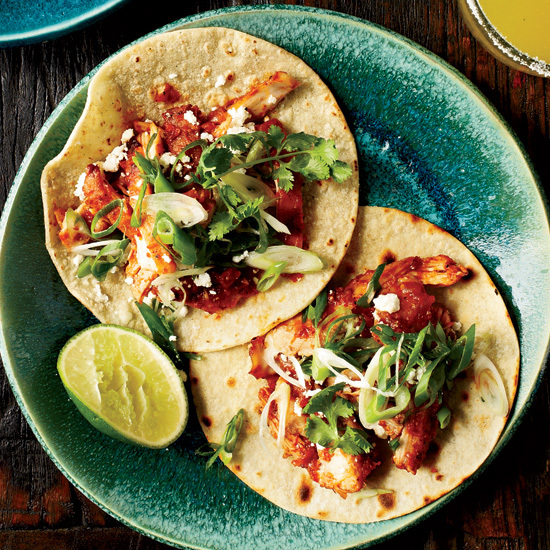 This spicy, tomato-saucy chicken is an excellent filling for tacos or served over rice in bowls. Refrigerate it for up to three days or freeze it for up to a month; reheat before serving. 2. Pork and Tomatillo Stew. Use your slow cooker to cook this classic Mexican dish, which, like the tinga, can be served with tortillas or over rice. Refrigerate it for up to three days or freeze for up to a month; reheat before serving. 3. Beef Stew. A hearty, comforting beef stew will stay tasty for days in the refrigerator and is easy to freeze and reheat. Try Jacques Pépin’s extra-rustic one made with Belgian pale ale or for something even more luxurious, make a stew with short ribs. 4. Meatballs. Whether you cook them in your slow cooker or on the stovetop, meatballs are a wonderful make-ahead meal to reheat as needed. 5. Chicken Dijon. This comforting French-style chicken dish can be made up to three days ahead and reheated gently, as needed. 6. Lasagna. You can assemble a pan of this crowd-pleaser a night ahead so all you have to do is bake it for dinner. 7. Enchiladas. Like lasagna, enchiladas can be assembled and refrigerated up to a day ahead and baked the next day. 8. Grain Salads. Sturdy enough to hold up for a day or two in the fridge, grain salads, like one with wheat berries, kale and butternut squash or black beans and quinoa, are a delicious, healthy alternative to meat-heavy meals. Plus, you can simply serve them at room temperature; no reheating needed. 9. Curry. An easy Indian-style curry is a great make-ahead dish; it can be refrigerated for at least day. Alternatively, you can make this spicy coconut curry sauce at least five days ahead and use it to simmer chicken, shrimp or vegetables soon before serving. 10. Quiche. These savory pies are wonderful anytime of day. Slice and reheat as needed.